Zing! Straight to Your Heart!Hi! My name is Arrow, and I'm a sweet, outgoing, and playful gray and white tuxedo DSH gal who was born in April 2018. I love to talk to you, and I always have lots to say! I was named Arrow because I have such a beautiful triangular face and pointed ears that my foster meowmy thought I looked like an arrow. My brother was named Bow to match, and my sister, Feather to go along with the theme! Our cat mama was rescued as a pregnant stray from a parking lot, and we were born in our foster home the very next day! Talk about just in time! Bow, Feather, and I all love to play together, so I would love a home with one of my siblings or with other kitties to play with. Well-behaved children or cat-friendly dogs would be okay too! I just want a loving home where I will never end up homeless and outside like my mama was. Don’t you want to take me (and Bow or Feather, for that matter!) home today?Arrow is updated on shots, spayed, dewormed, microchipped, FIV/ FeLV negative, and ready for her indoor-only home. No de-clawing permitted. Her adoption fee is $125 for kittens 9 months old and younger, cash or check payable to Buster's Friends. 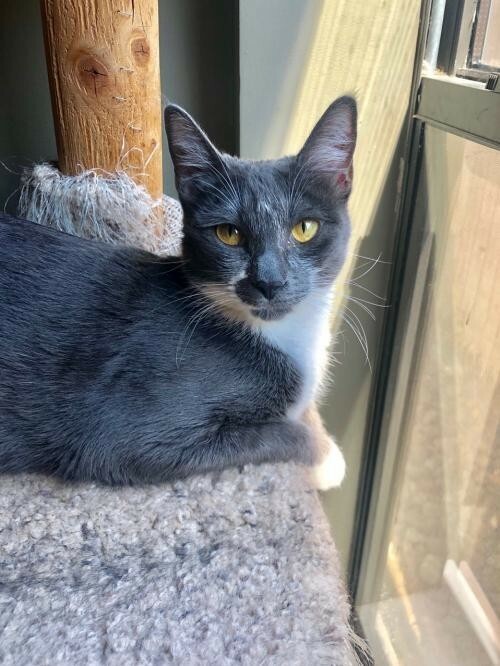 Please write to her foster if you are interested in Arrow, and we can let you know exactly where you can meet her.To adopt one of our cats, you must fill out our adoption application and be approved by one of our adoption counselors. To make the process more efficient, download the adoption application at http://www.bustersfriends.org/catadoptionapplication.shtml. First save and then open it; then you can print it and fill it out.Several of our cats can be seen at the following adoption venues 7 days a week and can be adopted any time the store is open. ADOPTION LOCATIONS1). Patti's Pet Depot, 14618 Memorial (@ Dairy Ashford); 77079; (832) 358-1600There is always a cat available 7 days a week, anytime the store is open! 2) PetSmart #1780 (Heights), 1907 Taylor St. (@ I-10); 77007; (713) 863-0533Cats are available 7 days a week, any time the store is open! 3) PetSmart #1766 (Memorial City), 9718 Katy Freeway (@ Bunker Hill); 77055; (713) 932-9909 Cats are available 7 days a week, any time the store is open!Visit this organization's web site to see any additional information available about this pet.